1.Pre-heat oven to 180 degrees Celcius. 2. Grease the baking pan with butter or oil or use a non-stick cooking spray. I used a 8″ square pan. 3. Sift together the flour, salt, baking powder, baking soda, cocoa and sugar into a large mixing bowl &Mix well. 4. In another bowl beat butter then add Slowly add the dry mixture to the wet mixture while beating well in one direction. Keep beating until the entire dry mixture is fully incorporated. 5. Now add the milk slowly and beat for a minute. 6. Pour the mixture into the greased pan. You do not have to spread the mixture using a spoon, if the mixture is of the right consistency. Tap the cake tin to release any trapped air bubbles. 7.Place in the centre of the pre-heated oven and bake for 30 minutes. The temperature and baking time can vary from oven to oven. Hence, test the cake at around 25 minutes to see if it is done. . Bake for 25 to 30 minutes, until a wooden tooth pick inserted into the center of the cake comes out clean. 8.Remove the pan and let the cake cool for 10 minutes. Invert it. 9. 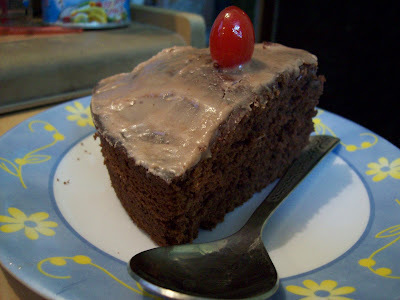 A rich moist yummy egg less chocolate cake is ready! Serve it with icecream! Yummmmmy! wow... looks really delicious Cake .. Templates looks good dear..
That looks perfect and delicious.. Nice n easy cake... your burfi also looks tempting! Enjoy the festivities by participating in Christmas Feast Event. lovely cake! looks so simple and elegant. New look of your blog looks nice. Snow effect is beautiful. 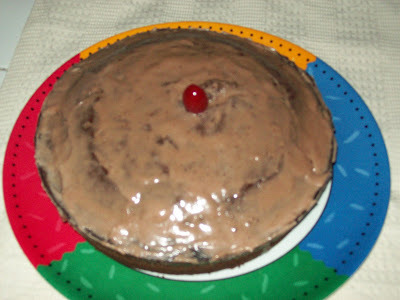 Choclate cake looks fantablous. Burfi also looks delicious. Delicious cake Jaishree and minus the eggs gr8. Have just announced a new event on my blog "Baking For Beginners". Do check it out. Wow the cake is just perfect. even luvd your burfi. I ve seen ur previous post. U didn't have any anti-virus installed? Hope u ve recovered everything! looks really moist and delicious Jaishree. 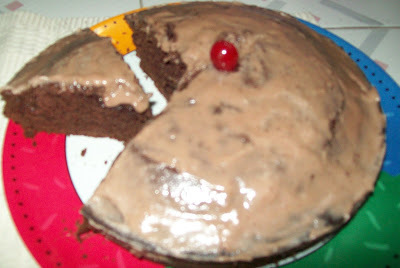 I remember while on chat the other day, you told me that you are gonna try this cake. I gonna try this. Thank you, dear. Good one Jaishree. I have not tried this recipe for an eggless cake. Regarding frosting, you have to wait until the cake cools completely. You can even keep the cake in the fridge to cool it. After taking the cake out of the oven, let the cake cool for an hour or so at room temperature. Then do a very thin coating with the frosting and keep it in the fridge. Then the next day or after a couple of hours do the full frosting.